Selling a coop without a broker is not as difficult as agents in the city will have you believe. Most home owners with the gusto to even try to sell their coop alone usually give up after listing it FSBO on Zillow for a few weeks. Floor plan – if there’s already a floor plan of your unit online, make sure you have permission to use it. Often times the floor plan for a previous listing of your unit will belong to the listing broker and/or seller. It’s important to have a floor plan for your unit as 50% of buyers will not visit a property unless they’ve seen a floor plan. If you feel awkward asking for permission or simply cannot find an existing floor plan for your home, schedule a visit with a draftsman to measure a new one for you right away. Purchase application – this is the infamous “NYC coop board package purchase application” which all coop buyers will need to complete and submit to the coop board. Sometimes called an “apartment resale application,” this intensive request will typically require multiple copies of the entire board package to be mailed or couriered to the building management company. The building management company will then submit the board package to the coop board for review and approval. In coop sales with a traditional broker, the listing agent will typically review the board package before it gets submitted to the building management company. The purchase application will typically also ask the buyer to submit federal income tax returns, W-2’s, multiple reference letters, a copy of the fully executed contract of sale, the mortgage commitment letter if the buyer is financing, copies of recent bank statements and pay stubs and signed copies of various disclosures (i.e. lead-based paint). House rules – similar to the bylaws of a condominium, the house rules of a coop govern daily life within the coop. Expect to see rules about roof usage, acceptable noise levels, pet policy and use of common areas. Coop house rules are generally stricter than the bylaws of a condo given the greater degree of power that a coop board has versus a condo board. NYC coop sublet policy – this is one of the most important documents you’ll need to have handy for selling a coop without a broker. Most home buyers will appreciate some flexibility in being able to sublet (i.e. rent out) their home given the high transaction costs associated with selling property in NYC. Sublet policies will differ dramatically between coops and are always subject to change. Many coops will allow subletting for 3 out of every 5 years, meaning you have to live there for 2 out of the 5 years. Some coops will allow unrestricted subletting right away while others will not permit subletting at all. Most coops will have a fee associated with any income earned from subletting your coop. In many cases it will be a percentage (i.e. 20% is fairly common) of sublet income. In other cases it may be a percentage of maintenance charges for the unit or it could be an uncorrelated fixed fee. Sublease application – this is almost as important as the actual sublease policy. Home buyers will want to see this to determine how difficult and onerous it is to actually sublet the home if subletting is allowed. Alteration agreement – many home buyers will have renovations in mind to customize their new purchase just the way they like it. As a result, it’s important for them to see the alteration agreement to get a sense of how onerous and difficult the process will be in your coop. Building financial statements – as part of the due diligence done on behalf of the buyer, the buyer’s attorney will want to see the coop’s audited financials for the most recent two or three years. The buyer’s lawyer will want to see that the building is not running a consistent loss, has a reasonable reserve fund, does not have delinquent shareholders and doesn’t have major outstanding lawsuits. Coop board minutes – reviewing the board minutes (i.e. summary transcript of board meetings) will be an important part of the buyer’s due diligence process. The buyer’s attorney will review the minutes to get a better sense of how the building is doing, how it’s run and the social dynamics within the coop board and in the building. Selling a coop without a broker is difficult enough, the last thing you’ll want are board minutes packed with heated arguments about lawsuits and penalties against shareholders. The buyer’s attorney will want to make sure the coop board is composed of sane and reasonable people. Building budget – as part of due diligence, the buyer’s attorney will want to review the most current financial budget of the building. He or she will want to review what shareholders’ maintenance is being used for and what planned expenditures in the near future will be. It will be a way for the buyer to understand what future associated costs of owning this coop may be. Assessments – if there are any current or planned building assessments, it’ll be very important for the buyer to know. Assessments are additional monthly charges in addition to monthly maintenance charges. Assessments are typically non-recurring and levied to cover major capital improvements (i.e. replace an old elevator) or to make up for a deficiency in the building reserve fund. Major assessments are typically spread out over many months to reduce monthly costs for shareholders, this is especially relevant for residents who may not have a lot of funds in reserve. Proprietary lease – this is document between the shareholder and coop which governs the terms of the shareholder’s residence of a particular apartment within the building. Please remember that in a coop, the co-operative corporation owns the entire building and is governed by a co-op board similar to a board of directors for a normal stock corporation. The corporation is owned by shareholders who have these proprietary leases which give them the right to occupy a certain apartment within the building. Selling a coop without a broker successfully in New York City will require you to effectively engage the 90% of buyers who are represented by real estate agents. 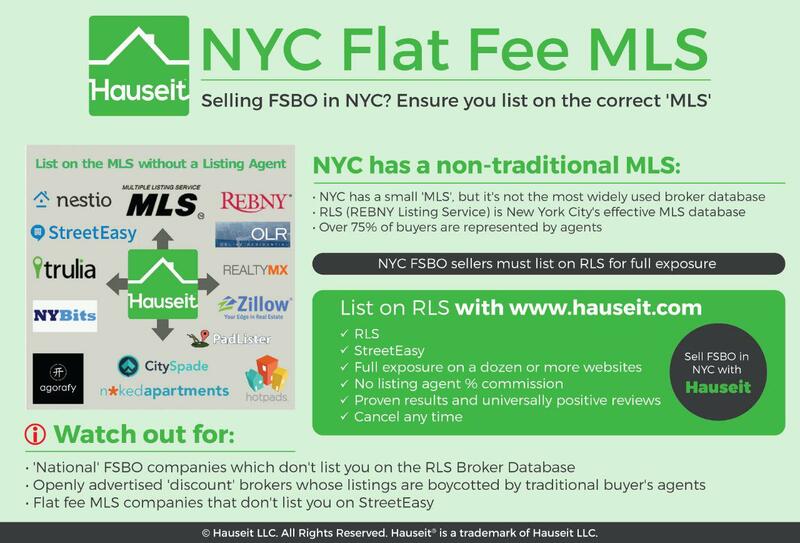 Make sure you sign up with a reputable flat fee MLS listing company who will get you in relevant broker databases and websites for New York City. Many “national” for sale by owner websites who claim to cover all 50 states will promise to ambiguously list you in your “local MLS.” Be careful as NYC does not have a dominant MLS like most regions of the United States. In NYC the primary inter-brokerage listings database is the RLS (REBNY Listing Service) which is operated by the Real Estate Board of New York (REBNY). Many international buyers who are mostly led around by buyers’ agents are only in town for a few days and want to view everything in one day. Buyers’ agents are even more important for luxury properties priced over $2 million. The market is not as liquid or deep for luxury properties and the fewer buyers are mostly led around by buyers’ agents. As a result, many out of town buyers will not have flexibility on re-scheduling or accommodating your schedule. Being able to show at all times is one of the primary benefits of having a real estate listing agent in New York City. Since you’ll already have full exposure to all buyers like the 96% of listings which are for sale by agent, what will give your co-op FSBO sale listing a boost? Consider investing a few hundred dollars in professional photographs which will present your home to buyers online in the best possible light. Great listing photographs will pay you dividends long after you’ve accepted an offer. For example, a buyer who has accepted an offer will be more likely to show off the listing to his friends if it has great photos. After who, who wants to be embarrassed when they show their friends the home they’re about to buy? Request permission if necessary from your co-op building management company to hold open houses on upcoming Saturday and/or Sunday afternoons. Try to take advantage of cross traffic if you see open houses listed by other units in your building. There’s no reason not to have your open house at the same time as theirs! Make sure your building allows open houses. Some co-ops may not allow open houses at all or may only allow “open houses by appointment only.” That simply means buyers and brokers will have to email you for an appointment at a specific time slot during your “open house. Congratulations on accepting an offer! It’s important to keep in mind that offers are not binding in real estate until the purchase and sale contract has been fully executed (i.e. signed by first the buyer then the seller as well). At any point before the buyer first signs the contract, he or she could walk away without penalty. The only damage caused will be some slight embarrassment by the buyer’s agent. Similarly, you as the seller can walk away at any point before you have counter-signed the contract. This means that you can receive and accept a higher offer even after the buyer has signed the contract! In this circumstance, the only damage done will be some slight embarrassment on your listing agent’s part should you have one. Though more rare, sellers have also been known to send out multiple contracts to different buyers. Although there may be an expectation or hope of exclusivity from either party after the offer has been accepted, there is no requirement for either party to remain wedded to the transaction before contracts are signed. Make sure the offer submitted by direct buyers or their agents is complete. That typically means an offer email that contains a REBNY Financial Statement, pre-approval letter, short professional biography, any contingencies or special timing and of course price and anticipated financing structure. The amount of information requested by listing agents for condo purchases may occasionally be more lenient, especially if there is cash buyer involved with privacy concerns. In those situations, it may be acceptable to only require proof of funds from the buyer (i.e. bank statement). However, because co-op’s need to make sure the future potential shareholder will be financially solvent and able to continue paying maintenance, the requirements for submitting an offer typically have no flexibility. Moreover, co-ops require applicants to undergo a board interview and generally have stricter criteria on the financial condition of the applicant. In New York City, it’s imperative that both the buyer and the seller have a real estate attorney to advise and negotiate the purchase and sale contract for them and to guide them through closing. While it is not legally required to have a real estate attorney, it is almost impossible not to have one for most people given the highly customized nature of purchase contracts in NYC. This stands in sharp contrast to some other states where the purchase contracts are standardized forms which the Realtors do without needing to involve a real estate lawyer. Selling a coop without a broker is a little more difficult versus selling a condo without a broker because after the contract is fully signed, your buyer will have to complete and submit the board package and then be invited for a board interview if the board likes what they see in the board package. Co-op buyers can always be rejected by the board and this does happen from time to time. This will obviously be a contingency negotiated by the buyer’s lawyer and rejection is a clear reason for the buyer to be able to back out of the contract with his good faith deposit. Board rejections can be mitigated by carefully screening all offers you receive and picking one which you as the seller know will have the combination of the highest price, highest chance of getting board approval and highest chance of closing (i.e. if the buyer is financing with a mortgage, how likely are they to get a commitment letter from the bank). In contrast, once a contract is fully executed for a condo purchase, there is usually little room for the buyer to back out and for the deal to fall apart. A typical contingency for a condo will be a “mortgage contingency” in which the buyer can back out with his good faith deposit if he fails to secure a bank commitment letter within a certain number of days. At that point, the buyer could either walk or continue to be in contract without the protection of that contingency clause. You should provide the buyer with some tips on the board and how to best pass the co-op board interview since you’ve gone through it yourself! A common piece of advice is to not ask any questions and not bring up future planned renovations during the interview. The reason for this is you don’t want the board to perceive you as a future, trouble-making shareholder who will just cause them more work. Some agents claim that boards will often ask at the end whether you have any questions simply to test whether you will be a troublemaker! It’s best to just be yourself and friendly and sail through the interview without causing too much trouble. After the board interview you simply need to wait for the buyer to secure his or her commitment letter and a “clear to close” from their bank if they are purchasing with a mortgage. If the buyer is financing the purchase, his bank will want to conduct a property appraisal. It is important to note that the bank will be loaning against the appraised amount versus the purchase price. The bank will send a licensed real estate appraiser to inspect the property who will then produce an appraisal report. The appraised value may be higher or lower than the purchase price and this may impact the amount of financing the buyer is able to obtain. Consult your attorney on the ramifications of getting a lower appraised value and whether the buyer may have an out if they are only able to receive a certain amount of bank financing. The home inspection is typically ordered by the buyer before the contract is signed. A licensed home inspector will visit the property and since you’re selling a coop without a broker you will be expected to coordinate the showing and be there versus the listing agent. The home inspector will be trained to look out for shoddy wiring, potential issues with the pipes, faulty appliances and boilers as well as structural issues in the building. If any major issues are discovered, the buyer may request a price reduction as a concession. While not universally done nor very common, home inspections are recommended for buyers since real estate is sold in New York “as is” and under the principle of caveat emptor (i.e. buyer beware). In lieu of a signed property disclosure form since most sellers are not engineers who could competently analyze the condition of their property, most sellers give home buyers a standard $500 closing credit instead. The buyer and his or her agent will do a “final walk-through” to inspect the apartment for any changes in the status of the home usually the day before closing. The purpose is to make sure that there haven’t been any damage or change to the apartment since it was last seen by the buyer. The buyer will test the lighting, appliances, faucets and showers and look for new damage to the apartment since it was last viewed. In situations where the buyer intends to “gut renovate” the apartment, the final walk through becomes a mere formality to check for major structural damage and to check the functionality of any appliances the buyer is keeping. Congratulations on selling a coop without a broker! Though the process is more difficult than selling a condo FSBO, it is certainly worth it given the high NYC real estate taxes and closing costs for coops in NYC.